An inquest into the death of a 70-year-old Donegal woman who was knocked down by a car shortly after Christmas in 2013 has begun. 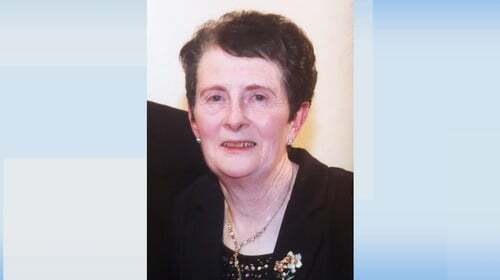 Maura Porter was struck by a car a short distance from her home in Carndonagh on 30 December. The inquest has been told it was 50 minutes before an ambulance arrived to take her to Altnagelvin hospital in Derry where she died. Ms Porter's husband Neil told the inquest at Buncrana courthouse that Maura went for a walk every day and on this day was going to the church and back. He said she would generally go and light a candle. He said she left home at about 4.40pm and at 5.55pm his son received a phone call from a neighbour to say that she had been knocked down by a car. Mr Porter said his wife was lying in the hard shoulder about 200m from their house. Mr Porter, a retired fireman, said she was unconscious and unresponsive, and that she was very badly hurt and he could not do anything to help her. He said there was pandemonium there because they were trying to get an ambulance and it went on for a long time. He said an ambulance eventually arrived and took her to Altnagelvin Hospital where she died at 11.45pm. The next morning, Mr Porter said, the man who had been driving the car called to his house with a Reverend Minister and told him he did not see Maura and had hit her. Austin Stewart, the driver of the car, told the inquest that he was driving home from work in Carndonagh at around 40km/h. He said around 180 metres after making a left turn he felt an impact to the front left side of the car, and saw something flash past his left side and brought the car to a halt. He got out and saw a person lying on her side about 45 metres back. A woman driving a car behind him also stopped. He dialed 999. Mr Stewart said Ms Porter was not wearing any reflectors or high viz clothes and he did not know where she had come from. Seamus Gunn, solicitor for the Porter family, put it to Mr Stewart that there was no NCT for the Peugeot 407 he was driving and he agreed. Mr Gunn also said there was a defective left front light and an excessively worn front right tyre. Mr Stewart said he was aware of the tyre afterwards and his solicitor said the faulty light was also found after and he said it was not known if it was faulty before or as a result of the accident. Mr Stewart also denied there was a phone call to his car at the time of the incident. Anita O'Donnell, who was driving behind Mr Stewart, said she saw what looked like red cardboard boxes being thrown in the air but then she saw a shoe and realised it was a person. She stopped her car and went to the woman who, she said, opened her eyes and looked up at her. The inquest was told that people gathered and brought blankets and hot water bottles and some phoned doctors. Dr Seamus Kelly arrived about 25 minutes after the impact, a second doctor arrived within minutes of him and a paramedic vehicle arrived about 40 minutes after impact, according to Mr Stewart. Ms O'Donnell said when she asked about the ambulance the operator told her the Carndonagh based ambulance was in Letterkenny. Advanced paramedic Gary Gardiner told the inquest that he was working in the rapid response unit in Letterkenny when he got a call at 5.49pm about the incident at Carndonagh. He went to the scene at 5.50pm and arrived at 6.25pm. There were three doctors there when he arrived and Ms Porter was on oxygen. He began treating Ms Porter and when the main ambulance arrived she was transferred to Altnagelvin where she died that night. The Director of the National Ambulance Service has told the inquest that on the day she was knocked down, there were nine ambulances rostered on in Co Donegal, and five of them were backed-up at the Emergency Department of Letterkenny University Hospital. Professor Cathal O'Donnell chaired a review team that was set up in response to Ms Porter's death and the prolonged delay in the ambulance response. Professor O'Donnell said that the ambulances were held up for hours and hours, minding patients in corridors when they should be available for dispatch. He said the one key causal factor was an ambulance offload delay at the Emergency Department for several hours, which led to significant depletion of emergency ambulance services in Donegal and a prolonged response to the 999 call at 5.45pm.